West Caicos, the far west island of the Turks & Caicos archipelago, is the site for Quintess, LRW's newest enclave, Molasses Reef (coming in 2010). Tucked within the premier Ritz-Carlton Reserve resort, the enclave features five free-standing, custom beachfront villas. 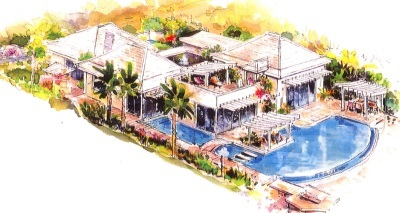 The villas are designed with classic Caribbean plantation-style architecture in mind, have 80 feet of ocean frontage each, and lead out to the Club's beach. The villas are also conveniently located within minutes of the beach club and hotel. In addition to the Club's own welcome center, Quintess members will have full access to the adjacent Ritz-Carlton Reserve resort including all of its renowned services, products and experiences. Some of the amenities the 125-room Ritz-Carlton offers are: a fitness room with personal trainers, on-site concierge service, butler, children's programs and child care, priority reservations at any of the three resort restaurants and a full-service spa. Other Molasses Reef perks, created by the combined efforts of Ritz and Quintess, are complimentary transportation to resort facilities like the marina, electric cars or bicycle rentals for use on West Caicos and chauffeured transportation around Grand Turk. Inter-island transportation is also available. This is Quintess's second enclave. Their first, Cielos Palmillas, is located within the The Palmilla Hotel in Cabo San Lucas. For the past 100 years up until now, West Caicos has been uninhabited. In addition to the development of the Ritz-Carlton Reserve resort and the Quintess Molasses Reef villas, a select few can call this island home. Island Villas, a residential section of the Ritz-Carlton Reserve are selling for upwards of 2.4 Million. The villas have 2-bedroom, 3-bedroom and penthouse-style floor plans and are approximately 2,200 to 5,560 square feet of living space. This small eco-conscious community will share in the stewardship responsibilities of preserving the land to keep up its natural beauty for generations to come. All villa owners will have full access to the Ritz-Carlton Reserve resort and all of its services, experiences and amenities. The Turks & Caicos is a group of islands located 575 miles south of Miami, Florida. The island chain covers 193 square miles of the Caribbean and is home to one of the longest coral reefs in the world. Turks & Caicos has been a destination club hot spot for years. Although Quintess will be the first (and possibly only) destination club to develop property on West Caicos, the neighboring island of Providenciales is home to several clubs. Earlier this month Lusso announced a new home on Providenciales. It's no wonder people want to come and play. The islands have beautiful beaches, a relaxed pace and yet offer all sorts of sports and water activities. Providenciales is the main entry point for the archipelago. Its international airport has several daily flights to major cities in the United States and Canada as well as flights to and from London. Quintess and Exclusive Resorts are the first destination clubs to offer an enclave or a resort within a resort option for members. The other destination clubs offer individual free standing homes, and in major cities have spacious apartments.